Deccan Serai Hotel is a unit of At Home Hospitality Services Pvt.Ltd and well reputed name in the hospitality industry. The objective of the company is to professionally manage a successful hotel and restaurant business. Deccan Serai Hotel is categorized in 4-star luxury hotel that boasts a prime location at Raheja Mind Space, Hitec City. This hotel is deeply connected with the land of Hyderabad which talks about the rich heritage about the Telangana state. One can find the best rooms under their budget without compromising with the quality of the services. The hotel looks forward to make guests feel at home and provide them with every possible support to make their journey to the top an enjoyable one. We are ranked among the best budget hotels in Hyderabad and create a fun filled stay for our guests. In short, whether you are looking for 4 star hotels in Hyderabad or luxury hotels near Hitec City, your search ends with Deccan Serai Hotel. The leading 4 star facility hotel is appreciated for the quality of rooms, facilities and services and recognized as the best hotel of Hitec City. The Deccan Serai Hotel is located in Hitec City and is around 35 KM from Shamshabad International Airport, 15 KM from Hyderabad-Deccan Railway Station and around 4 km from Hitec City Metro station. 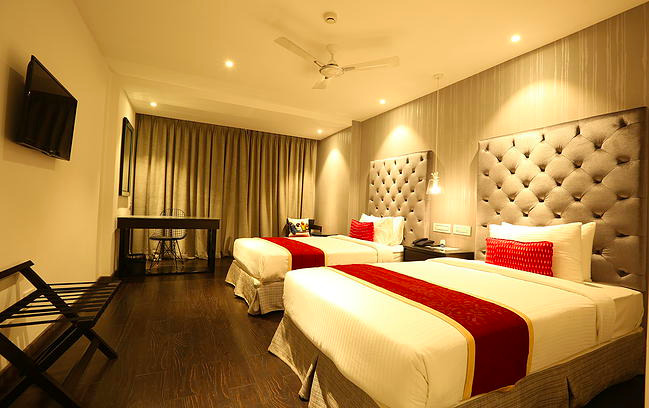 Deccan Serai hotel has 100 luxurious rooms fitted with comprehensive amenities to ensure a pleasant stay. A safe choice for those who are looking for a truly First-class accommodation in Hyderabad.